A closet is just a closet, right? Not necessarily. If you have always made do with the standard closets that come with your home, you may have no idea of the world of possibilities out there. A well-designed custom closet serves two purposes: it adds to the aesthetics of your home and, more importantly, it simplifies and supports your lifestyle. Here are five tips for creating a custom closet that can truly change your life. If you can only put one custom closet in your home, place it in the master bedroom. You will be able to clear away clutter, maximizing living space. You will be sure that small but valuable items, such as rings and cufflinks, are never misplaced. And if you are one of the many homeowners who tends to stash everything you don’t know what to do with in your bedroom, you will finally have all of your items organized and available at your fingertips. Make the most of your new custom closet with closet accessories. Careful planning can nearly double the storage capacity of the closet! Jewelry organizers, hanging shoe racks and purse storage bags, scarf holders that double as tie racks, slide-out belt racks, foldaway ironing boards, and drawer units are just a few of your options. Ask everyone in the family to pare down their wardrobes, getting rid of items that no longer fit or are no longer wanted. Then use barriers such as custom dressers or wardrobe lifts to create individualized space. Next, have everyone organize their closets together to combine items that make sense to store together. For example, everyone’s rain gear might go together in one section of the custom closet, while long-term storage items go in labeled boxes in another section. Organize your items based on how often you use them, centering the things you use every day. Group mix and match items in sections to make it easier to throw together a coordinated outfit. Make space for a nice laundry hamper with a removable liner. Closet organizers are readily available in big box home improvement stores, and they work fairly well in some situations. If you really want your closet to change your life, though, an off the shelf solution is not enough. Bring in a closet design expert who can listen to your wants and needs, observe your existing décor, identify your current storage challenges, and synthesize everything together to create a custom closet that is as individual as you are. There are innumerable types of storage bins on the market, from plain acrylic boxes to decorative baskets. Storage bins are a wonderful way to organize your life by gathering small or oddly shaped items into collections. Choose bins that are both functional and beautiful to transform your space. Here are a few ideas for using storage bins to organize every room of your home. 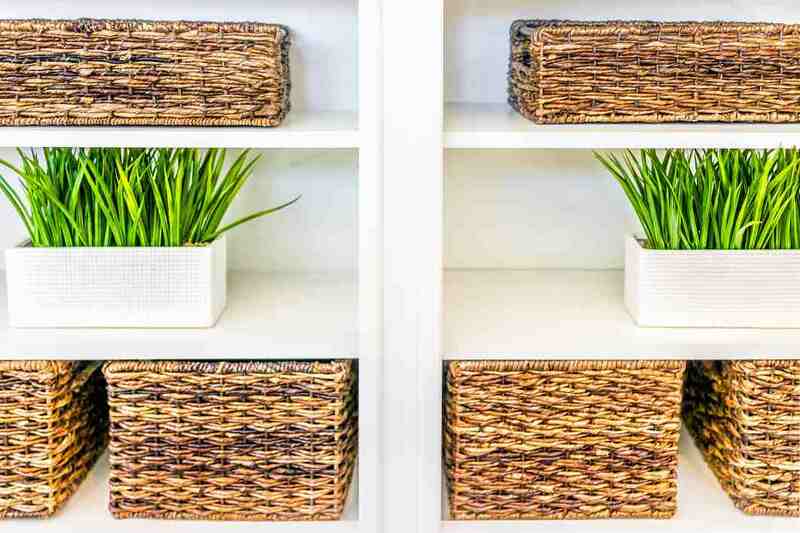 Baskets are available in such a wide array of shapes, sizes, and colors that you can find a place for them in virtually any room. Fabric and craft supplies fit wonderfully into a medium-sized basket in the office or the den. A large basket inside a kitchen cabinet can organize utensils that you use infrequently. A bathroom basket is a fancy way to store essentials from extra toilet paper to a collection of makeup. Brightly colored fabric bins are big enough to hold numerous small items, but small enough not to create clutter. Consider labeling your bins so that you see at a glance what each one contains. Tall fabric bins can store long items like rolls of wrapping paper, while smaller totes can easily hold extra clutch bags or wallets. They’re not the prettiest option, but clear plastic storage drawers definitely have their place. Use them to organize tools, office supplies, or even small pantry items. If the look does not appeal to you, use them only in spaces such as the laundry room or mud room, or hide them in cabinets. Since they fit well into closets and pantries, or even under sinks, acrylic stacking bins are highly useful throughout the house. They create vertical storage and can hold everything from underwear to toys to bathroom supplies, depending on size. Larger plastic tubs make excellent homes for Christmas decorations or other seasonal items that need to be protected from dust and bugs when being stored in a garage or shed. Instead of throwing out your shoe boxes, recycle them into decorative storage containers. You can easily cover them with gift wrap or a similar lightweight covering to make them more attractive. Shoe boxes can hold small collections, toys, or even office supplies. Best of all, a box is included with each shoe purchase, allowing you to dramatically cut down your spending on storage bins. For best results, sort your household items into categories and give each category one or more containers of its own. Label closed containers so you can easily tell what it is in them, and place each container in the room where the contents get the most use. With storage bins, there is no reason you can’t organize your life while enhancing the attractiveness of your space. 2018 is bringing some of the most popular and sought-after luxury closet trends that are going to make a huge splash this year! Chandeliers : Having a beautiful chandelier in your walk-in is quickly becoming one of the trendiest additions to any luxury home. You can quickly turn a drab, boring closet into a fabulously beautiful space with just the right piece of lightning equipment. Whether you want to go full-glam with sparkles and pendants or conservatively sleek with clean lines, a chandelier adds something a little extra to the room to make it stand apart from the crowd. Light and Airy Colors : More and more, we see people moving away from darker, stately colors in favor of lighter and brighter options. White and other lighter colored built-ins have been racing to the top of the popularity lists and are predicted to be a top-seller for 2018. While darker hues such as mahogany and chocolate bring a sense of warmth to a room, lighter colors tend to brighten up the feel of a space and even create the illusion of a larger area. Mirrors : Mirrors have a growing presence in the closet. Floor to ceiling mirrors on walls and in-laid mirror on door fronts are among the most popular. Not only do they give a closet a finished look, but they can add a sense of glam and dazzle, bringing your closet up to the next level. Practicality never looked so good! Built-In Hampers : A hamper is a necessity for any closet, but having a big basket full of dirty clothes shoved in a corner isn’t doing much for the luxuriousness of your space. That is why the built-in hamper has been one of the most sought after closet additions in recent months. With the hamper door, you have easy-access as well as the pleasure of not having to look at it day in and day out. Valet Rods: Another closet accessory that has been steadily growing in popularity is the valet rod: a super simple but life changing closet tool. The valet rod allows you to extend your hanging space temporarily; it’s great for setting out garments for special occasions or as an extra hand when putting away your clothes. Closet Corners: maximizing a closet’s corners is every bit as challenging as it is rewarding. 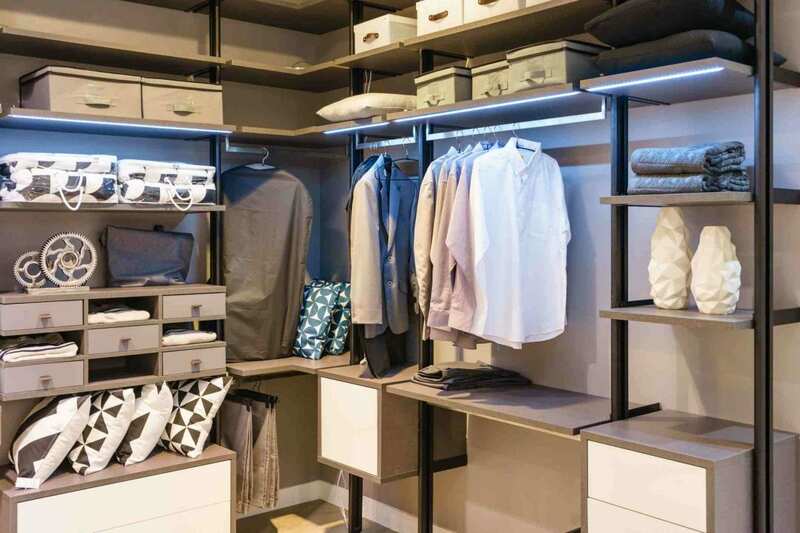 Optimized correctly, the space in the corner can mean the beginning of a most functional, smart closet design that’s appealing & beautiful, because closet organizers are all about open storage solutions & maximizing those challenging spaces. SHOES SHOES SHOES: Shoes are entirely essential in every closet. Trying to capitalize on this, off-the-shelf organization companies are ready to sell you any number of contraptions to add to your closet that claim to wrangle your footwear. It only makes sense that whether you have a massive walk-in boutique-style closetor you’re stuck with a too-small reach-in, shoe storage would be at the top of your priority list. Rather than depending on shoe boxes, racks, or carousels that can waste valuable space in a small closet, give custom design a try. Even in a reach-in closet, a custom arrangement of shelves, hanging rods, drawers, and—yes—shoe shelves will help maximize the space you do have. Back Wall Accenting : Anything from paint accents to wallpaper to adhesive wood wall paneling can serve to take your closet to the next level. Adding a color pop or accent behind your open closet units lends an inspiring, high-design effect that will have you giving as many walk-in walk-through tours as you can. Staging areas: are another big trend. “As social media becomes an increasingly present part of our style choices, staging areas need to not only function well for creating looks, but also must be beautifully designed to showcase new looks and share them across social channels,” said Lisa Adams of LA Closet Design in Los Angeles. In today’s home renovation world, HGTV is the leader in content. Across the country they are involved in home builds, remodels and home searches. Their opinion matters and if you are a home owner, we suggest taking notice. Remodeling and organizing your closets can streamline your life and—when the time comes—the sale of your home. Organized with a purpose. If your closet consists of a single rod, give it a makeover. Today’s closets are larger, deeper and taller, and walk-in closets are a must for master bedrooms. They are also more elaborate and offer diverse storage areas, such as shelving units, built-in shoe racks, roll-out drawers, organizational bins and even a pull-out ironing board. Dresser in the closet. Some homeowners are building cabinets in their closets and centerpiece storage — almost like an island — for shoes and underwear. His-and-her closets. Like dual vanities, personalized space, privacy and designated storage areas are in demand by today’s homeowners.